To Steve McFarland, the news didn’t come as a surprise. 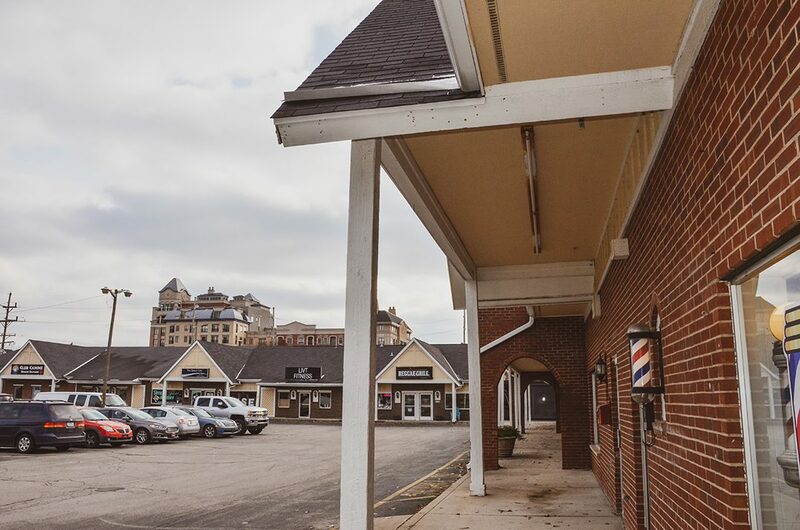 The owner of Carmel’s School of Rock said he knew it was only a matter of time before the aging Monon Square shopping center, which is home to his business and many others, would be sold for redevelopment. The City of Carmel used $15 million in 2017 tax increment financing bonds to purchase the strip mall on the northwest corner of Range Line Road and City Center Drive from the Lawhead family, who did not respond to a request for comment. Built primarily in the 1970’s, the city has big plans for the strip mall on 8.7 acres, including mixed-use buildings up to five stories and a parking garage that can be retrofitted if autonomous cars become popular in the not-too-distant future. The city expects to create a master plan for the site and then select developers to create projects that fit into the vision, much like it did with the purchase of 88 acres to develop City Center near the turn of the century. But for now, it has hired Mohawk Management to handle Monon Square’s operations. Monon Square tenants have been told it may be years before the existing buildings are demolished, and the city is hoping many of the existing businesses will be a good fit for the new development. But for McFarland, the sale has led to more questions than answers. 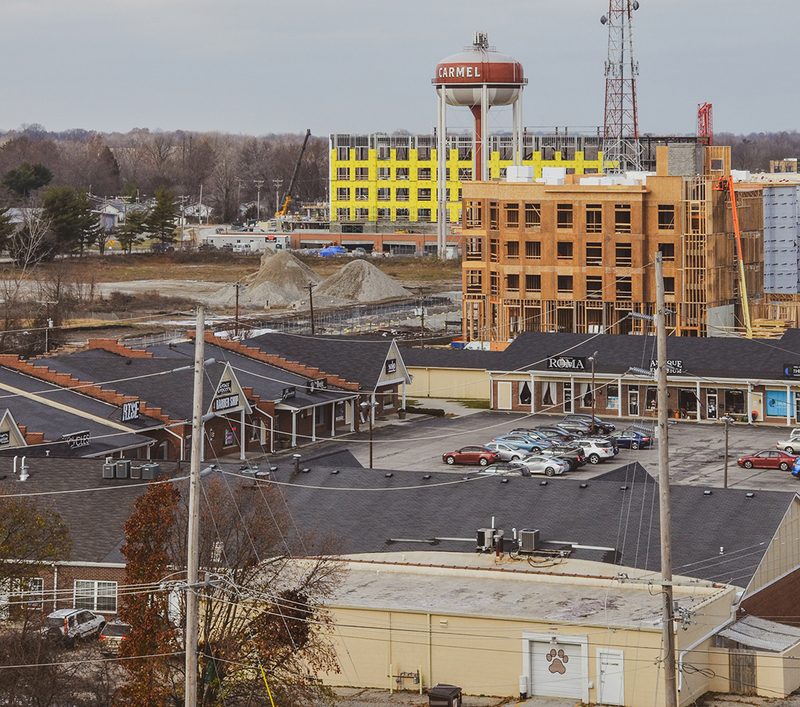 In 2014, city leaders presented their vision for the Midtown area to connect the Arts & Design District and City Center, and the plan is coming to fruition all around Monon Square with the transformation of Range Line Road to the east, expansion of the Monon Trail to the west and several new buildings under construction nearby. Although the purchase announcement may have not been a surprise, Monon Square business owners are now forced to take a look at what it means for their future. Eldon Chuck, who opened Jamaican Reggae Grill in the shopping center in April 2015, said he hopes he can stay in the new building but isn’t sure he’ll be able to afford it. Carmel Mayor Jim Brainard said the city is brainstorming ways to support the existing businesses through the transition. He said the future developer could build in a reduced rent structure for existing clients, at least temporarily. Another option could be designing some of the retail spaces to be much smaller than those offered now. Brainard said most retail spaces are on standardized pads 2,000 to 5,000 square feet, which is much more space than some businesses need. By cutting the spaces down to 300 to 600 square feet and moving restroom facilities to a shared space, some of the existing tenants may be more likely to stay, he said. Chuck said that solution might be a good fit for his restaurant. “It’s out-of-the-box thinking, and it could work,” he said. But for McFarland, whose 3,000-square-foot facility is already at capacity during the school’s busiest times, downsizing isn’t an option. “It doesn’t help me,” he said. Although it may be years before Monon Square is rebuilt, Brainard’s vision for the area includes expanding Veterans Way through the property to reduce traffic on Range Line Road and building a parking structure wrapped with other types of development to hide it. He also plans to include a public plaza along the Monon Trail, similar in atmosphere to the one there today near Union Brewing Company. The city wants to create unique sights and stops all along the Monon from the Monon Community Center to the Arts & Design District and beyond. “The idea is to have a series of interesting places for people,” Brainard said. Chuck said he’s generally supportive of the city’s vision for Monon Square and redevelopment in general, but he’s hoping those plans will include his business. The future parking garage at Monon Square – as well as others recently built in Carmel – is expected to be built with the future in mind. City leaders believe the rise of driverless cars will greatly reduce the need for parking spaces. If driverless cars become as popular as city leaders expect, Brainard said a five- or six-story garage could be converted to two or three stories with ramps to the floors no longer used for parking being removed and converted to a courtyard space. Bryant Walker Smith, an assistant professor at the University of South Carolina who has done extensive research on the future of transportation, said some municipal and private developers are expecting major shifts in parking and curb demand in the coming decades.